June 20, 2016, Tioga, ND – The Bank of Tioga has earned the high performance standard of being the #2 top performing bank in the state among “C” Corporation banks in 2015. According to the FDIC call report, The Bank of Tioga ranked #2 in both ROE and ROA in the state of North Dakota among C-Corp banks. 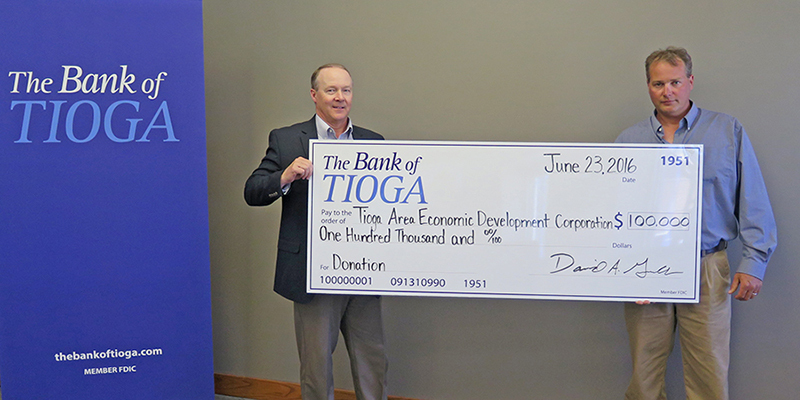 To celebrate, a gift of $100,000 is being presented from The Bank of Tioga to the Tioga Area Economic Development Corporation as the initial funding for the purpose of building a new community center in Tioga. To help share the excitement of this news The Bank of Tioga wants to recognize its loyal clients and dedicated employees and give back to the community for this project. For this reason, a gift of $100,000 has been selected to start a fundraising effort to build a new community center in Tioga. The donation will be made to the Tioga Area Economic Development Corporation which has agreed to steer the project. “We appreciate the vision and generosity shown by The Bank of Tioga in making this donation. A new community center is much desired by our citizens, and we intend to work with the City of Tioga and other interested parties to complete the planning and construction of the facility which would likely be situated on the current Farm Festival Building location,” said Chris Norgaard, President of the Tioga Area Economic Development Corporation. The Bank of Tioga’s mission is to help ignite prosperity in the lives of others which strengthens local communities and preserves the viability and resurgence of community banking. Additionally, the bank strives to reinvest in its local communities. In 2015, The Bank of Tioga also presented a multi-year donations for building projects of $100,000 to Tioga Medical Center and $50,000 to Crosby Kids Daycare. “We are excited to give back in a meaningful way. We are hopeful that this donation will serve as a catalyst to create enthusiasm and further participation to ultimately complete this project which would be an important visible sign of progress in our community and improve the quality of life for Tioga and surrounding residents,” said David Grubb, The Bank of Tioga Market President. The Bank of Tioga with $295 million in assets, was chartered in December 1951 and has operated continuously in Williams County, ND since its inception. The Bank of Tioga values citizenship, exceptional client service, serving as a business leader in its community, and is committed to reinvesting in the community through sponsorships, donations, and local non-profits. Locations include Tioga and Crosby, ND. As of October 31, 2014, The Bank of Tioga was acquired by The TS Banking Group and TS Contrarian Bancshares, and David Grubb is Market President.